My Family Tree is high DPI aware and supports per monitor DPI in Windows® 8.1 and later. This means that the user interface scales correctly and renders crisply, be that on a 4K monitor or a small laptop screen. With display zoom, you can customise the size of the text and controls in My Family Tree. This helps to make things easier to read on high resolution screens and gives easier navigation on touch screens. 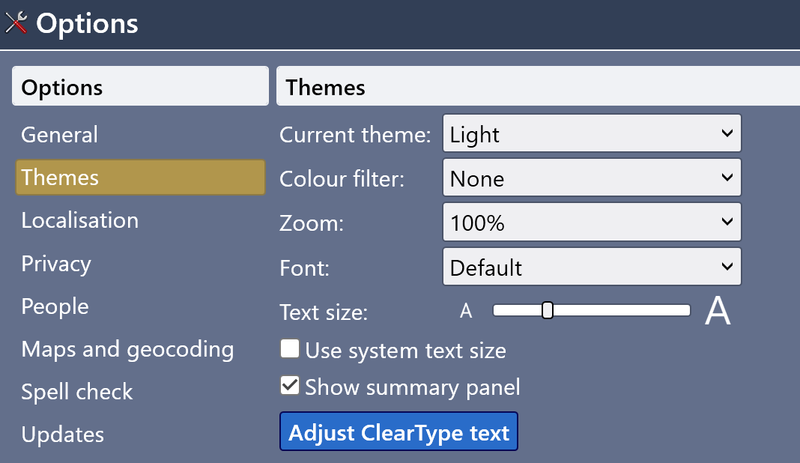 You can change the zoom level with special keyboard shortcuts ( + to increase, + to decrease, or + to reset the zoom) or manually using the Themes menu. The default setting is 100% which represents no zoom and you can increase this up to 500% according to your needs. Fig 1. The zoom levels (left) and the themes menu (right). You can increase the size of the text everywhere in My Family Tree. This helps to make text easier to read without scaling the entire user interface. Text size can be configured in Tools>Options>Themes. Fig 2. Changing the text size. The colour tone can be customised and allow users to emulate placing a coloured overlay on the screen. This may be useful for dyslexic users or those who experience visual stress. Fig 3. Customising a colour tone filter (left) and the resulting effect (right). Navigate to the next control. + Navigate to the previous control. + Navigate to the next control when focus is captured. + + Navigate to the previous control when focus is captured. + or Open a context menu for the current control. or Give focus to the main menu. + or Expand a drop down list. Toggle the selected state of an item. Activate contextual help for the current control. Screen readers allow blind or visually impaired users to read the text that is displayed on the computer screen with a speech synthesizer or braille display. 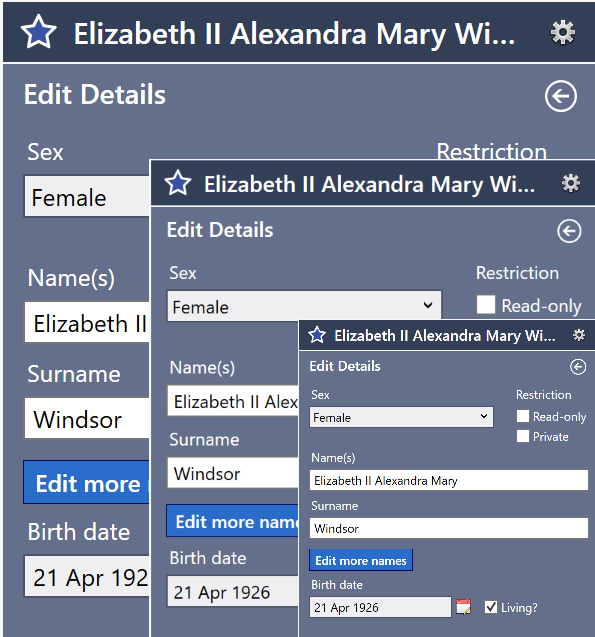 My Family Tree is supported for use with screen readers which are compatible with Microsoft UI Automation, such as Windows Narrator. My Family Tree includes the open source OpenDyslexic typeface by opendyslexic.org which was created to increase text readability for people with dyslexia or dyslexic tendencies. You can use + to toggle between OpenDyslexic and the default font. A dyslexic theme is also available which uses a neutral cream coloured background for all screen elements to reduce glare. You can change the application theme using the Themes menu. Fig 4. The OpenDyslexic typeface (left) and Dyslexic theme (right). 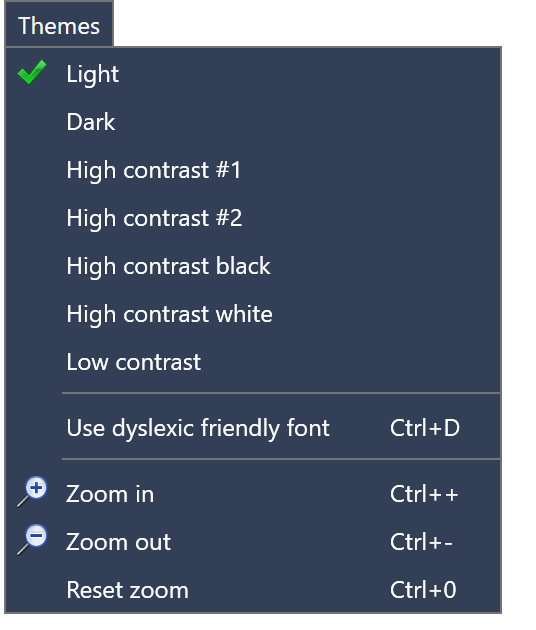 High contrast themes heighten the colour contrast of some text and images on your computer screen, making those items more distinct and easier to identify. My Family Tree has full support for the system wide high contrast settings in Windows. You can also choose from one of four built in high contrast application themes if you prefer to use high contrast themes only within My Family Tree. You can change the application theme using the Themes menu. Fig 5. The High Contrast #2 theme (left) and a custom system high contrast theme (right). The application theme can be changed to according to the light level of the environment where the application is being used. A dark theme may be more suitable in brighter environments. The theme can be quickly toggled between light and dark using the task bar thumb button. Fig 6. The task bar change theme thumb button.